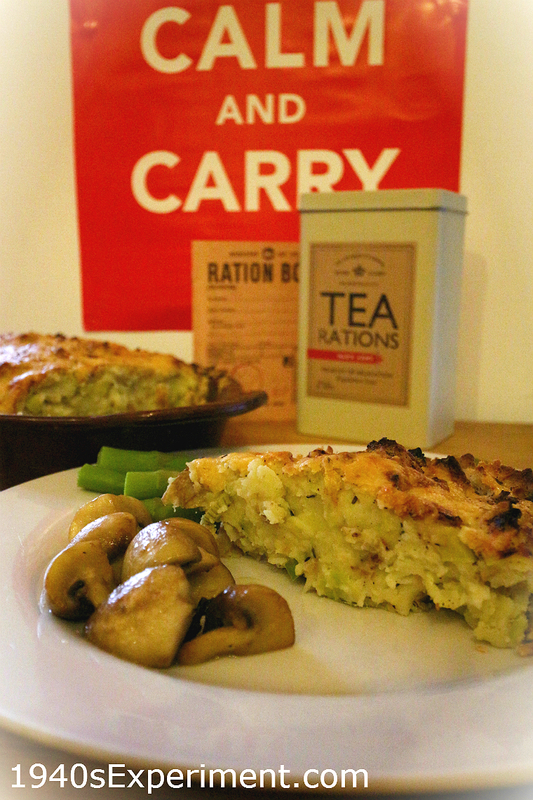 Here it is… the promised Homity Pie recipe! Let me tell you, it’s totally delicious, TOTALLY! 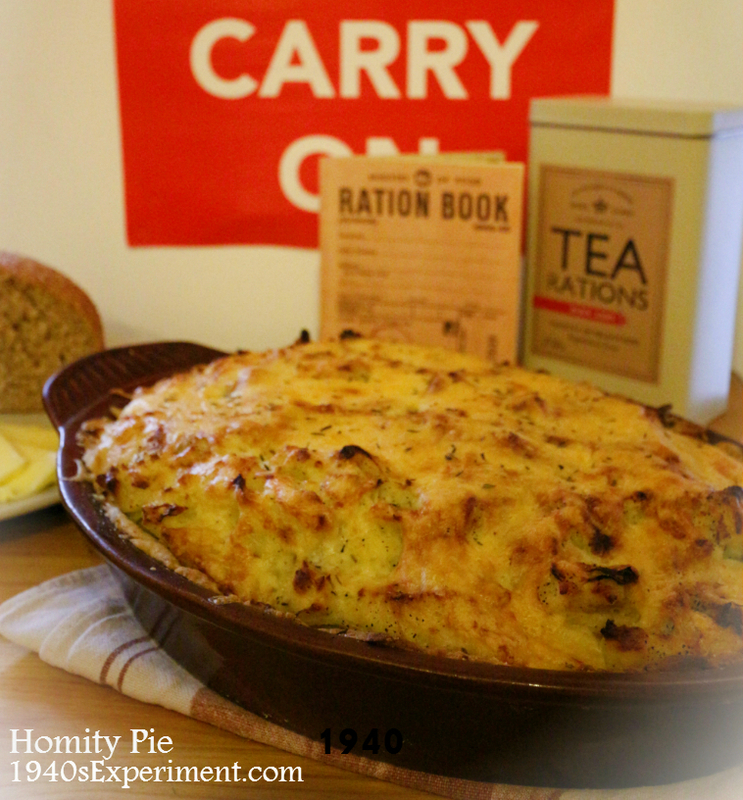 Homity Pie is an open topped pie said to have first been made by Land-Girls during WW2 and supposedly to have originated in the West Country. 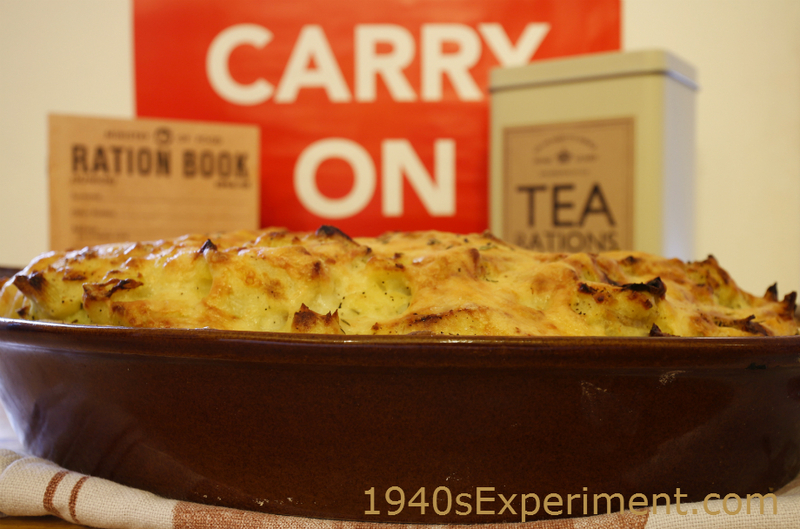 It’s REALLY difficult finding the original recipe as there are so many bastardised versions hanging around on the internet, so after having researched for hours (yes I am a food nerd) and comparing recipes with rationing, the below recipe is likely the closest version to it’s origins taking into account the scarcity of eggs and onions. You HAVE to make this. It’s delicious and so easily portable when cold, that it makes it perfect to take on a picnic! Make the shortcrust pastry using plain flour (we used half strong wholemeal and half white) and 3 oz fat (I used 1/2 veg shortening and 1/2 hard margarine). Rub fat into flour to make breadcrumbs and then bind together with a little water to make a pliable dough. Roll the dough out into a greased pie dish, mine measured about 10″ x 6″ and place it into oven on 200 c for about 10 minutes or so to half cook. Drain potatoes then add to pan of leeks, 1 whisked egg, add more butter or marg and 2oz of the grated cheese and loosely mix, add in lots of salt and pepper until it tastes good! This entry was posted in Uncategorized and tagged homity pie. Bookmark the permalink. Oh wow, that sounds fabulous. Kind of like a quiche with almost no egg. It has been getting too warm to contemplate heavier meals like this but I like the idea of having it cold and it’s not hot enough here yet to make the idea of turning on the oven unbearable. Must give this a try. Carolyn, any thoughts about possible egg substitution? I am vegan and don’t do eggs. The cheese is no problem as I have Daiyaa great cheese substitute. I’m vegan too and just having had a look at this recipe I reckoned pureed silken tofu might work as a replacement for the egg in this. Looks very yummy! Love your posts. You might check out my blog where I have various American WWII recipes. Keep up the great work! http://www.auntlilskitchen.com. My mum started making this when I went vegetarian 12 years ago or so! It’s now known affectionately as Poverty Pie to my parents and godmother, although I must admit to having loathed it due to the bits of onion that always used to lurk in it (I used to find cooked onion revolting). I don’t eat cheese these days, but Poverty Pie is still made regularly – I think my mum’s recipe is a plainer one, with just potato, an onion, a bit of cheese and milk and parsley and pastry on top. Funny how these things pop up out of nowhere! First time here and so glad to find this authentic recipe – thanks for doing the hard work searching for it! I’m going to try this for tea tonight. Only thing I wonder, would leaving the apple out be a problem? I’m not too keen on fruit in savoury dishes – but I’m willing to give it a go if it makes all the difference. Homity pie, totally yum! made it for dinner tonight. I am a British ex- pat living in Tasmania, was brought up on this kind of food early post war years , mum was a good plain cook who knew how to stretch the budget. Can anyone help with a recipe an old aunt once gave me? “Wartime apple tart” from memory it was pastry lined plate, thinly sliced Apple layered on top baked till tender then I think a mixture of custard powder sugar, water, boiled and placed on top. Love your blog, working my way through recipes, many thanks. Made this and everyone loved it! Making again tonight but with a twist, using the potato/leek and cheese mix as topping for a shepherds pie made with lentils, its in the oven niw and I can’t wait!